You've got things that need to be written. Let me write it for you. Start with grabbing your copy of my book below. Writing YOUR About Page, writing YOUR Video Sales Scripts, writing YOUR eBook Optin offers or FB ads ... all have never been easier. Especially for entrepreneurs who are strapped for time, hate to write about themselves, or just can't find the right words. If finding a good copywriter is, as the Great Frank Kern says, "A pain in the a**! ", then say, "GOODBYE!" to the pain once you work with Carrie once! 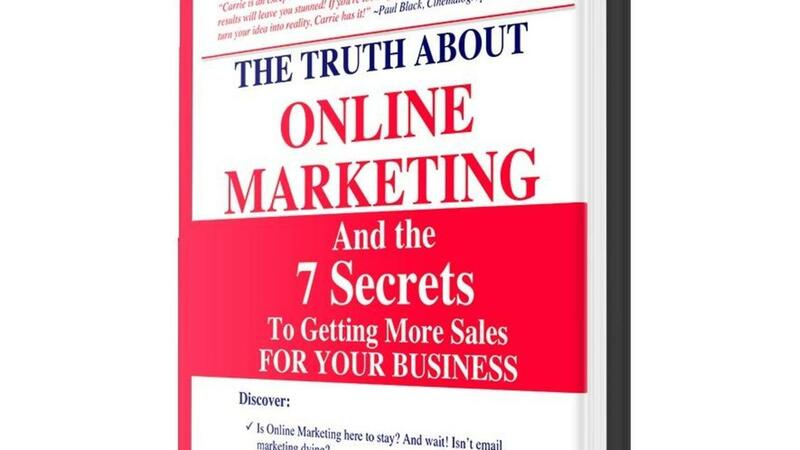 Get your copy of "The Truth About Online Marketing" today and let's see how we could work together. A picture is worth 1000 words, but the right words sell 1000 pictures. Turn your business ideas over to the expert who can spin those ideas into engaging stories. Give your clients the best experience at their fingertips that will turn them into mad, raving fans! Picture moving from where you are now to having more freedom of time to spend on those things most important to you. Because I'm back at the office, writing it for you. Engage your clients using the exact right words in the exact right way that excite and convert. Storytelling is more than just saying something interesting. It creates a compelling connection with your clients and converts easily by showing them the message of how you help them. Enter your name and email for instant access to this exclusive HIGH-CONTENT training today! I WANT TO ATTRACT IDEAL CLIENTS NOW!